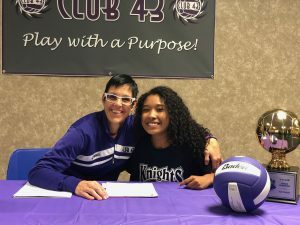 Jaelyn Young didn’t start playing volleyball until the sixth grade, and she didn’t take the sport too seriously even into high school. But after her sophomore season ended, Young realized she wanted to play more volleyball. Young set a lofty goal: Play Division I volleyball someplace. But she didn’t enjoy the club she was playing for and didn’t believe it was providing her the training or the pushing that she wanted and needed to help her close the gap with other players who established that dream far earlier than her. But one random summer day, Jaelyn joined a friend from Edina for an open gym session at CLUB 43. She recognized other ambitious players, and she noticed something about CLUB 43 director Annie Adamczak-Glavan. Annie saw a raw player with subpar skill but athleticism and a knack for being in the right position. Annie suggested Jaelyn take some summer lessons at CLUB 43 then join one of her teams. Though she attended St. Paul Central, Jaelyn insisted to her parents that CLUB 43 was right for her development. Jaelyn’s father, Quincy, visited CLUB 43 — and he immediately hit it off with Annie. Given Jaelyn’s late interest in volleyball, Quincy was frustrated with the coddling approach and the lack of honesty he experienced in the local volleyball scene. When Jaelyn told Annie she aspired to play Division I, the coach told her Division II or III were more realistic. But Jaelyn made CLUB 43’s under-17 national team as a defensive specialist, and she quickly improved. “She was like a coach’s dream,” Annie says. “Whatever you tell her, she’s going to do. She’s on time, in the right spot. She’s supportive of her teammates. If she makes a mistake, it’s a mistake for the right reason. Jaelyn’s development was rewarded with a special opportunity — to serve as her team’s libero. Her athleticism and intuition made her a natural for the position. Then, her team played up at a national tournament in Dallas. Heather Stout, then an assistant coach at New York University, was watching Annie’s then 18-year-old daughter Kate. Heather was impressed by Kate and Jaelyn. Kate now plays at NYU, but Heather headed to Fairleigh Dickinson University in New Jersey as an assistant coach. “Is that libero signed?” Annie recalls Heather asking her earlier this year. On Thursday, Jaelyn signed her scholarship offer to Fairleigh Dickinson at CLUB 43. Jaelyn is thankful to Annie for her support. And that’s why Jaelyn won’t be straying too far; she’ll be tracking her younger club-mates and returning during her breaks.